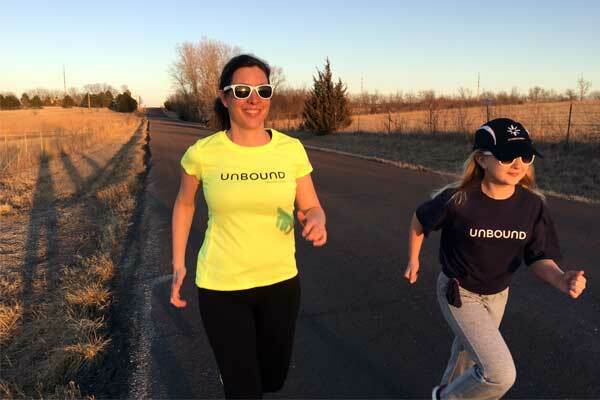 Topeka sponsor Christie Appelhanz and her daughter, Kate, often go for runs together. Sponsor Christie Appelhanz is starting her birthday celebration a couple days early. Not with a big party or a fancy dinner, but by running for charity. She’ll be visiting Kansas City on June 5 to take part in the Hospital Hill Run as an Unbound Trailblazer. Unbound is one of four charity partners for HHR this year, and 102 people have signed up for at least one HHR event as an Unbound Trailblazer. The Trailblazer program is a way for people to raise awareness and donations for Unbound through athletic events they already enjoy, such as marathons. For Christie, participating as a Trailblazer is a natural extension of her desire to help others. “I run to stay healthy and to hang out with my 9-year-old daughter, Kate,” she said. “5Ks keep me motivated. Christie has a passion for helping kids. She’s the executive director of the Children’s Alliance of Kansas and has volunteered overseas with the Peace Corps. Christie also wants to provide ways for her two children to learn about other people and places. When she heard about Unbound and how her family would have a chance to get to know the children they sponsor through letters, she knew it was a perfect fit. Christie and her family have been sponsoring for almost five years, and Unbound is already her “all-time favorite charity.” The letters back and forth give her confidence that their contributions are making a big impact in the lives of David and Yorleni. “With Unbound, I feel like I can make a difference,” Christie said. “I believe 100 percent in the work of Unbound and how they use their resources. And I like that there are so many ways to get involved — from submitting prayer requests to [participating in] the Trailblazer program. Want to learn more about becoming an Unbound Trailblazer? Visit UnboundTrailblazers.org or contact our Outreach team at [email protected] or (800) 875-6564.